Grand Staircase-Escalante National Monument is a massive area that could take you a lifetime to explore. It’s one of our favorite places for solitude, amazing geological formations, and night skies. 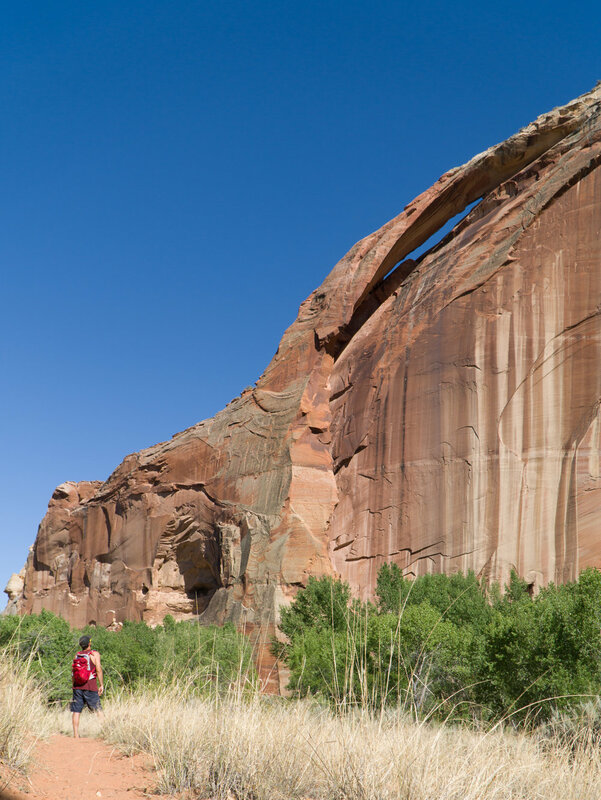 If you’re just passing through Escalante on a road trip, here are a few short day hikes we highly recommend. This is a relatively flat (5.8 miles) easy hike on sand and slick rock to Lower Calf Creek Falls (126 feet). Upon arrival to the falls, it seems as if you have reached a desert oasis. The air near the waterfall is crisp and cool, almost too cool for that dip we were talking about the whole hike. There is also camping, on site, which looks pretty awesome, but busy. The hike is scenic with classic southern Utah rock formations and a refreshing creek to cool off in. Just a short 4 mile round trip hike off HWY 12 will take you to the Escalante Natural Bridge. This is a very easy hike, it’s more of a stroll along the river. You will have to cross the river multiple times, but it is quite refreshing. After about 5 river crossings you will come to the natural bridge. This is a great place to relax in the river and cool off. If you want to extend the hike, you can head about another mile to a natural arch where you will find a pretty awesome Anasazi cliff dwelling ruins. A long bumpy ride down Hole in the Rock road will lead you to the trail heads of both Zebra and Spooky Slot Canyons. Note: Hole in the Rock Road is a very bumpy road our van almost rattled to death on the journey to and from these slot canyons. The trails are short, but there is little or no shade. So, bring water and appropriate head wear and more water than usual. Zebra slot canyon is a longer hike at around 6 miles. There is also another canyon called Tunnel Canyon, this will add an additional 2 miles and some navigation skills.